This entry was posted on Thursday, 15 December 2011 13:01 at 13:01	and is filed under Federalism in Sunni-Majority Areas of Iraq, Iraqi constitutional issues. You can follow any responses to this entry through the RSS 2.0 feed. Both comments and pings are currently closed. The knowledge level among politicians seems to be amazingly low. Time and time again they make statements suggesting no knowledge at all of the law. Just yesterday I read a Diyala councilmember from Allawi’s bloc talk about how it did not matter that the chairman hadn’t been present – he’d fled the country I believe – because they had “the required two-thirds vote.” The law says one-third is all that is needed to establish a referendum. I actually went back and looked at the statute to make sure I was remembering it right, because I couldn’t believe a councilmember would not know this. In some cases it is easy to think the misrepresentations of the law are politically driven, but it really appears a lot of them don’t understand the process. There is also the idea, promoted by some Shiite politicians, that the request somehow had to be signed in the governorate council building. Again, this is a complete concoction. It is possible they are thinking about the mafia-like situation in Basra back in 2007 when opponents of Fadila tried to fire the governor by meeting in the private home of one of the council members and made the decision there. I think the two-thirds confusion may have to do with a provision in the region formation law that says a two-thirds council decision will settle the matter if there are competing visions supported by a 10 per cent popular petition envisaging a different combination of governorates to form a federal region. Ah, maybe that’s it. So maybe she had read the law, just remembered the wrong part. It may not matter if the current stalemate continues. This is where the Supreme Court’s questionable decisions over the past two years come home to roost. The constitution explicitly grants the Court exclusive jurisdiction in deciding disputes between the provinces and the federal government. No lower courts, no appeals, straight to the top. But yet no one seems willing to sue Maliki for not implementing the law. The Sunni Arabs (irony) all want Talabani to intervene, perhaps mount a kind of coup against Maliki to “guarantee the constitution.” I don’t see it. But can they do that? Absolutely not. Not as part of a federalisation project as such.? But the got their federalism project on same bases they talking now? Isn’t right Reidar? What prevent them this time to do it or call fo same project, same what they have already 9 years ago? Writing from meeting of the Trondheim city council where it is pretty normal to make package deals between different politicial groups. Party A supports party B in case X, and party B supports party A in case Y. Undemocratic ?Uncocnstitutional ? I don’t think so. Ehem, Jan, I am sure your city councillors don’t think they can go about making changes to municipal and provincial boundaries without sticking to the relevant legal framework, i.e. http://www.lovdata.no/all/hl-20010615-070.html ?? Local councillors can propose arrangements; we had referenda during local elections this year, on changing regional borders: Two regions (fylker) were proposed to merge; and at the same time severa local communities (kommuner) within these regions had separate referenda on leaving their present region and joining another if the proposal for merger of the regions should fail (which it did). Yes, but the point is, you’re following the law, right? What Diyala is proposing about the disputed territories is not in the law, period. Jan, the problem is that changes to governorate boundaries are still governed by an old law, I think from the 1960s, which vests all the power to make changes in Bagdhad and this explicityly rules out what the Khanaqin Kurds are attempting in this case. The old law is antithetical to the constitution of 2005 but that constitution just fails to deal with the sub-governorate/governorate boundaries aspect. I think, generally speaking, it would benefit a culture of the rule of law and democracy in Iraq if at least an attempt were made to stick to the relevant constitutional clauses and the laws on the books. Good to see a commenter here relating political machinations in Iraqi provinces to the universal experience of most, if not all, provinces, states and local governments in other democracies. Because Iraqi provincial government councils are elected on the basis of proportional representation (as I assume they are in Norway?) and not on winner-take-all, these political manouvres and alliances are all to be even more expected, – as are interminable political arguments about what or what is not the law according to the constitution? That’s what happens in democracies. Of course, under the old regime these arguments would not be taking place at all and bloggers would have nothing to write about. I still ask why these governorates are not collecting the 10% signatures in order to seriously bolster their case for a referendum and why RV never seems to discuss this? Bb, I would have discussed such initiatives if they existed. 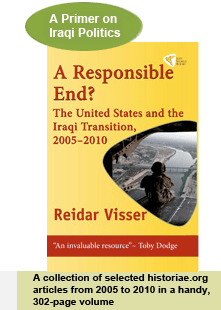 Their absence (or spectacular failure in the case of Basra 2008-2009) strongly seem to suggest that so far, there are maybe not that many people beyond the corrupt governorate politicians that are truly interested in spending time doctoring governorate boundaries in order to fit the aims of political parties and their agendas? An additional reason may be that the 10% popular initiative option does involve IHEC, meaning that Maliki could try to outmanouvre the whole initiative even before it got started. Look, thanks Reidar. At last! Your first point just confirms to me that the movements toward regionalisation are not yet all that serious, but more to do with opportunistic political posturing. All the bmore to be expected in a democracy. As to the second point – this seems to go to the old default position that Maliki=horns and tail. Honestly after that CNN interview with Saleh al-Mutlak telling the credulous Wolf Blitzer that Maliki is the greatest dictator in Iraqi history one wonders how any of this can be taken seriously – unless of course Mr Al-Mutlak has subsequently been taken off the streets by the Maliki security forces and his tortured remains found dumped on his family’s doorstep? Bb, there are actually reports Maliki is rounding up people in Diyala for the despicable crime of promoting the federal region. Also, there are reports about armed Shiite demonstrators opposing the bid. I am happy that the war in Iraq is finally over. It has been 9 long years for Americans and their families. We have lost so many soliders for a war that we never should have even been a part of. The U.S. has a thing about trying to fix everyone except their own land. Now maybe we can focus on what is really the issue here. That being our hungry, homeless, uneducated americans.